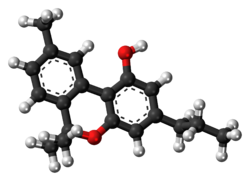 Cannabivarin (CBV), also known as cannabivarol, is a non-psychoactive cannabinoid found in minor amounts in the hemp plant Cannabis sativa. It is an analog of cannabinol (CBN) with the side chain shortened by two methylene bridges (-CH2-). CBV is an oxidation product of tetrahydrocannabivarin (THCV, THV). It has no double bond isomers nor stereoisomers. It is not scheduled by Convention on Psychotropic Substances. CBV is not scheduled at the federal level in the United States, but it could be considered an analog (of THC), in which case, sales or possession intended for human consumption could be prosecuted under the Federal Analog Act. ^ Keith Bailey, Denise Gagné (October 1975). “Distinction of synthetic cannabidiol, cannabichromene, and cannabivarin by GLC using on-column methylation”. Journal of Pharmaceutical Sciences. 64 (10): 1719–1720. CiteSeerX 10.1.1.689.8592. doi:10.1002/jps.2600641033.